A Grimsby postman who set out on a mission to run 500 miles in 100 days to raise awareness of mental health, received a hero's welcome as he finished his journey. And the "inspirational" postman finished his journey at Oasis Academy Wintringham, where he received a hero's welcome from his friends, family and colleagues, who made a guard of honour for him as he made his last few steps. 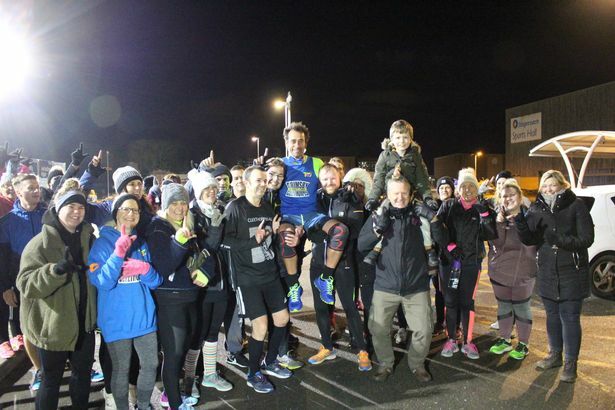 An emotional Roy spoke to Grimsby Live after finishing his challenge, where he expressed his pride in having reached 500 miles and hoped that his journey had inspired others to speak out about their mental health issues. He said: "I really can't believe that I have managed to reach 500 miles, it has been an incredible and very emotional journey. "It was quite funny, I had been running completely injury free, but then on the 96th day I injured my knee moving a cooker in my house. I wasn't even running. But thankfully it wasn't too bad and I managed to reach my goal. Roy's wife Laura was beaming with pride as her husband finished his journey, saying that he has inspired her to become counsellor so that she will be able to help others who are battling mental health issues. "There is a stigma that is often attached to mental health, but it doesn't have to be that way and speaking out about your problems is the only way that they are going to be resovled."